I consider myself fairly well versed when it comes to Japanese market vehicles. However, I ran across a vehicle I'd never heard of: The Nissan Pao. According to the all-knowing source for all information the Nissan Pao Wikipedia page, the Pao was introduced in 1989 as a retro variant of the Nissan Micra, and sold out in 90 days. 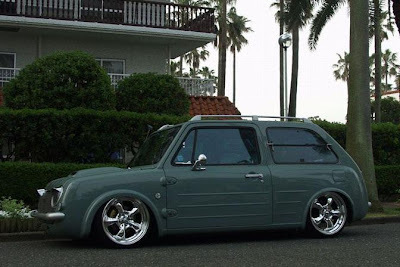 It is allegedly a highly sought after collector car in Japan. I figured you'd like this one! I saw one of these the other day while I was waiting to cross the street at a stop light.The car I saw looked almost exactly like the last picture,it was the same color too.The little Pao was easily the most delightful machine on the road in that morning rush hour traffic. Are you in Japan T.G.? Oh no,I live in Toronto,Canada.There is a law here that allows citizens to import Japan-only cars when they are at least 15 years old but not before that point.The Pao was made in 1989 so it would pass that that section of the criteria.In Vancouver, there is more JDM cars rolling around because there are a fair number of importers there when compared to here in Toronto. Gotcha. That's pretty cool. I wish the U.S. would allow that.